Less than a week before my birthday and Christmas, the happiness is just overflowing around me. Yay! Allow me to share the few little things that made me happy. Another source of weight gain and happiness! Spicy siomai (dimsum) available at any 7-11 branch. This served as one of my regular snacks for the past weeks. This is not our home. How I wish! This is not even a part of a cozy residential space. Would you believe that this happens to be the waiting area of a dermatological clinic? I didn't get any facial treatment though. This might surprise some of you but I never had any facial treatment yet. The reason why I landed to this clinic is because of my regular waxing treatment. Lay Bare, my go to waxing salon, refused to accept me because of their bulk of clients waiting. I walked around the mall, barely an hour before closing time. 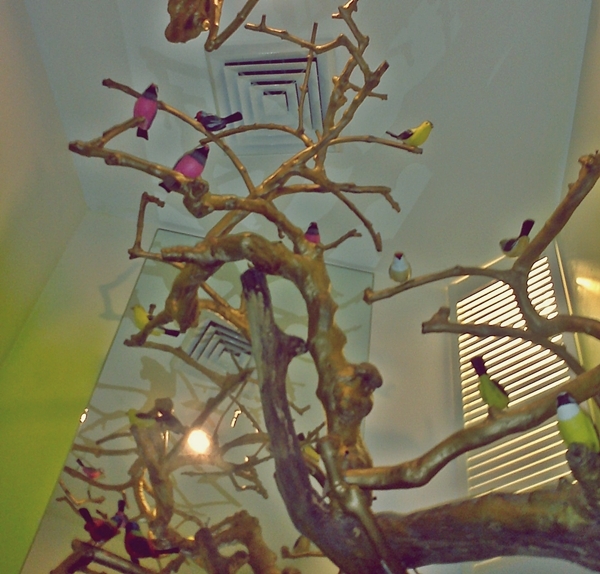 To my surprise, I found this posh and relaxing derma clinic that also provides waxing services. Happiness! I was immediately accommodated by one of their courteous staff. In less than 30 minutes, my most awaited waxing need was fulfilled. Thank you Dermcare! My happy experience with Dermcare was intensified by this view. While I was being tortured with the waxing ripping procedure, the artificial view and tweets relaxed my tired legs and body. Although services at Dermcare are a bit out of my budget, I wouldn't mind paying the extra once in a while. If the extra payment meant experiencing the best services, then I can accommodate some budget sacrifices. Meet my current read! I'm finally reading The Perks of Being a Wallflower. 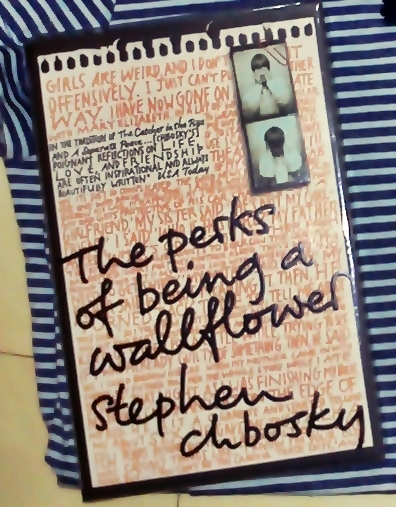 Let's see if my hopeless romantic hormones will get awakened by Stephen Chbosky. The shopaholic hormones strike again. Bad! Bad! Bad! I've been meaning to purchase this blue blouse months ago. When my 13th month pay arrived and I found this on the racks of my favorite boutique, I immediately followed my weak heart. Haha What I love about this blouse? It comes in my favorite color blue and the crocheted collar is so dainty. Hours before writing this post, I went malling with my friend Anne. 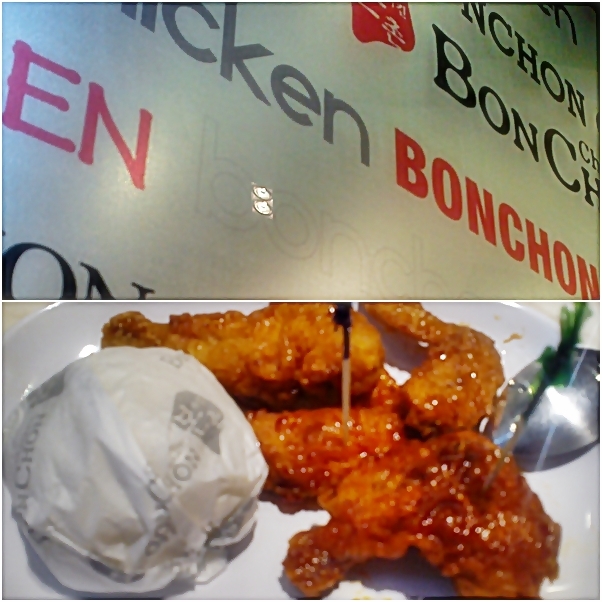 We watched our free movie from SM, did some shopping and ended the day with our favorite Chicken BonChon. How about you? What are the little few things that you happy this week. I'm starving for lunch now, Diane! I hope you have a great birthday and Christmas this year, hun. :D I've been shopping a whole lot lately, but mostly for Christmas. I love the top you bought. It's cute! I can't believe you can buy Dimsum @ 7-11!!! Yummy!!! PS The Perks of Being a Wallflower disturbed Shanley when she read it so I'm anxious to read what you think about it! are you loving the book or what? it's one of my favs. I love reading your posts Diane and seeing what you love. Happy Birthday and Christmas to you! I love that waxing salon maybe because green is my favorite color! This was the post I meant to link...so I did two this Sunday! Sweet holiday hugs, namemate and friend! Hi Diane, if you like California Maki you should try Omakase's Fried California Maki. Tried it this week and we really liked it :) Advance Happy Birthday!